To Hell With The Devil was my first exposure to Stryper. I remember lying in bed at night listening to this album, and the first song “Abyss (To Hell With The Devil),” would always give me the creeps. For a nine year old in ’86, that was one of the most frightening thing I remember listening too. Now 30 years later, every time I hear that intro, I think back to when I used to be so scared of that and it just makes me chuckle. Once I heard that Stryper were going on a 30th year anniversary tour for this album, I knew it was a show I could not miss. 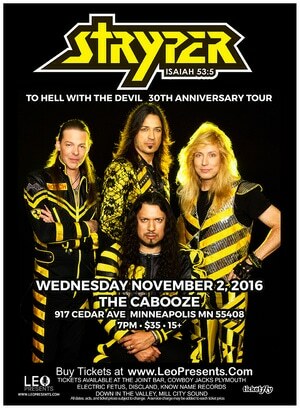 On November 2nd, Stryper made their stop in Minneapolis, Minnesota at a small club called The Cabooze. This would be my first show at this venue, and I must admit, I was not too thrilled about the layout of the place. It is a long narrow venue that can hold about 600 people with the stage that is located at the halfway point. So, once the crowd is in front of the stage, it is very difficult to move around the venue and get to the restrooms. It was really cool to see Stryper in a small intimate place, but I wish they would have played at a different venue. There was a local band that started the show, but I am not able to remember their name. I was not very impressed with their music, but they did try their best to entertain the crowd and get it fired up. They were younger musicians so I have to give them credit for doing what they love and getting up on stage to give it their all. 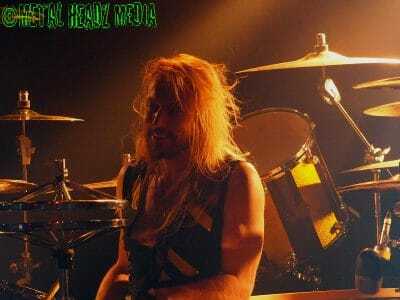 Prior to Stryper hitting the stage, they showed a video that talked about how Stryper came about and how To Hell With The Devil took them to the mainstream. Michael Sweet did the narration and talked at length how they toured for that album and how their fans took this album to the top of charts with the singles they released in the mid ’80s. Once the video was completed, “Abyss (To Hell With The Devil)” started to play through the speakers, and this got the crowd cheering. Before the intro was finished, Stryper were on stage getting ready to rip into “To Hell With The Devil.” From there, they played the album from front to back. Uploaded by Dave B on 2016-11-08. Bassist Tim Gaines spent most of the night stage right and looked to me like he was really into the show. I have read some comments how the fans feel he is distant from the show and they think he is not happy, but with the way he was playing and acting that night, I can say that it looked farther from the truth. 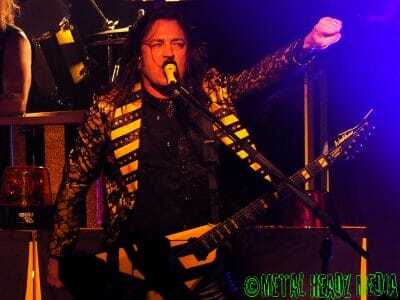 From all the previous times I have seen Stryper that is how he has always played live. Drummer Robert Sweet had his kit positioned sideways, which has been a tradition of his for many years. Robert Sweet and Gaines had great chemistry on stage and kept the backbone of the music loud and strong. Guitarist Oz Fox was stage left and was playing his guitar with authority. Fox also does a great job keeping the harmonies alive with his background vocals. Lead vocalist and guitarist Michael Sweet was sounding better than ever. His voice is still strong and his guitar playing is flawless. He is definitely one of the most underrated front men in rock. 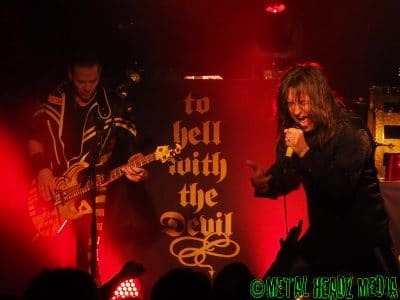 There was not too much talking to be had during their set of To Hell With The Devil, but Sweet did talk a little bit about how happy and proud he is that “Honestly” and “Free” reached #1 on Dial MTV. He also wanted to make sure the crowd knew that once “More Than A Man” was done, they were just going to leave for a little bit and then come back on stage to play another set. Uploaded by Dave B on 2016-11-06. A short break they did take, and the first song of their second set was “Yahweh” which is the first track from their recent release Fallen. Next song they played is one of my favorites — “In God We Trust.” It was not the version from the original release, as it sounded more like the remake version they did on the Reborn album. Since the release of The Covering album, Stryper has been known to throw in a few covers in their setlist. They played Black Sabbath’s “Heaven And Hell” and Van Halen’s “Ain’t Talkin’ ‘Bout Love” to perfection. They did an outstanding job with those covers and I know everyone in the crowd was loving it as well. Between these two songs, Michael Sweet did talk to the crowd for a little while about a bunch of different topics. He discussed how he missed the ’80s and that he could sing a lot higher then because of all the tight pants he was wearing; how they used Aquanet all the time; how the majority of the crowd was made up of guys; and how people could go to a concert in the ’80s and never have to worry about your safety. The latter point was in light of all the recent events in the last few years that have taken place at concerts. Lastly, Michael Sweet pointed out that he is not a fan of a lot of today’s rock music. The rest of Stryper‘s set included a few other hits and deeper cuts that their fans absolutely loved hearing live. Stryper sounded amazing on this night. 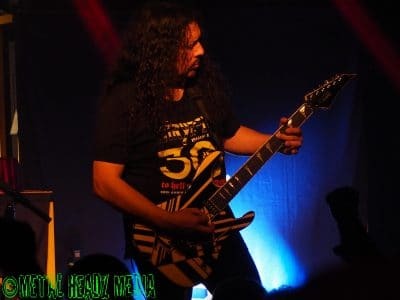 I heard many people leaving the show stating how much they loved it and that Stryper are one of the best live bands out there today. I walked out of the show ecstatic that I got to see this tour live and witness Stryper history.